It is the dream of every volunteer-based organization to have so many volunteers knocking on your door that you have to turn some of them away. Being able to fill every volunteer assignment instantly with a cheerful and skilled worker would make your job as a volunteer leader that much easier. Unfortunately, in many instances, organizations have more volunteer opportunities available than they have volunteers to fill them. This is when good volunteer recruitment is essential. Sometimes a lack of volunteers is simply due to potential volunteers not knowing about the opportunities you have available. Other times, you need a large volume of volunteers for an event or busy season, but cannot fill all of the positions from your current pool of volunteers. If your organization requires skilled volunteers, you may receive applications for assignments, but none with the right qualifications for the position. No matter the reason you need more volunteers, these recruitment tips and best practices will equip you to find as many volunteers as you need — and ones whose interests and talents are right for your organization’s needs! 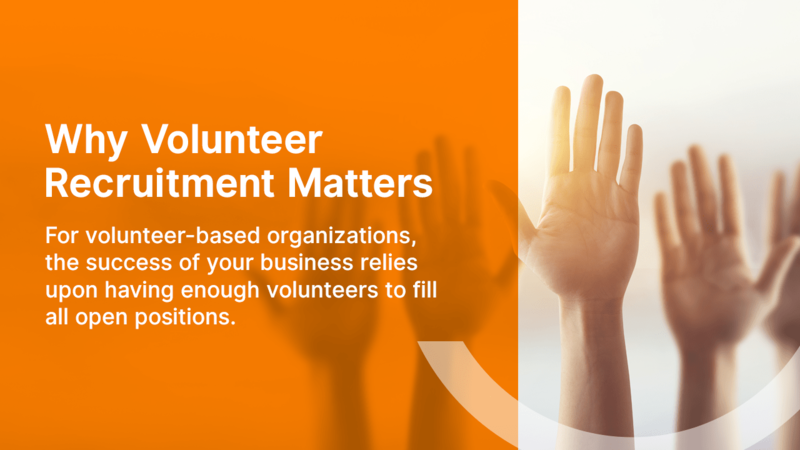 For volunteer-based organizations, the success of your business relies upon having enough volunteers to fill all open positions. You need to have enough hands on deck to direct visitors in your museum, pack boxes in your food bank or shelve books at your library. However, for your organization to really excel, these volunteers need to be those who are best-suited for your business. Volunteers at a theater should not be bored by Shakespeare and people serving at an animal shelter should not be allergic to dogs or cats. When volunteers are enthusiastic about the work they are doing, they will achieve more goals and help your organization succeed. Finding the best volunteers not only means your volunteers will be happier and do better work, but also that they are more likely to stick around long-term! Volunteer retention means you won’t need to recruit as often or spend time training new volunteers as frequently. This cuts training costs and allows your volunteers to spend more time actually serving. Volunteer recruitment has become even more important in recent years as the non-profit landscape has changed. Often, there are more volunteer opportunities than there are people seeking to serve. Potential volunteers have also become more selective about which organizations they want to work with. These changes have made volunteer recruitment somewhat competitive. To recruit the best volunteers, your organization needs to show potential volunteers why the work you do is important. Volunteers want to know they are supporting a good cause before they commit their time to volunteering with your business. However, through good volunteer recruitment efforts, you can make your organization and its goals visible to potential volunteers who would love to work with you. One of the most important parts of successful volunteer recruitment is advertising. Getting the word out about opportunities for volunteering with your organization is essential for attracting volunteers and getting them to apply. The trick to effective advertising is identifying and targeting the right people who are best-suited for your organization’s volunteer opportunities. What tasks will my volunteers be completing? Will my volunteers need any specific skills to complete these tasks? Where will I find volunteers with these skills? Will my volunteers be completing any physically strenuous tasks? Will my volunteers be in any sensitive or vulnerable situations? Is there a specific age group that would be best-suited for these roles? What interests should my volunteers have? Is there anything that would disqualify a potential volunteer from this role? These questions help you identify who would be the best candidate for a certain volunteer opportunity. They also help you examine any challenges your volunteers might face and identify any people who may not be able to complete the necessary tasks. Your volunteer recruitment should be as inclusive as possible and consider all genders, ages, and races. However, it is also important to consider safety and the capabilities of potential volunteers. 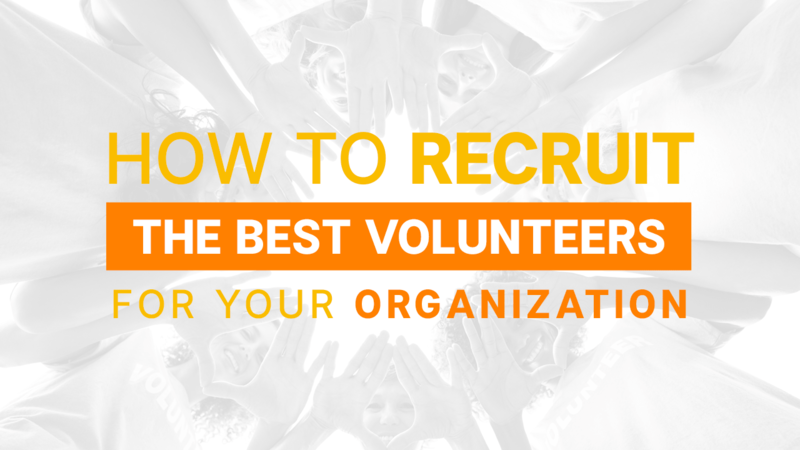 Recruitment for Volume: In some situations, your organization simply needs a lot of people to fill volunteer spots. Also called “warm body recruitment,” this technique works great when the positions you want to fill do not require specialized skills. These positions can be filled by young and old alike and are often short-term commitments. Recruiting for volume typically means doing an advertising blast on social media, speaking to large groups, or disseminating brochures and flyers. Targeted Recruitment: For positions that require specific skills or interests, you should focus your advertising to target those groups. 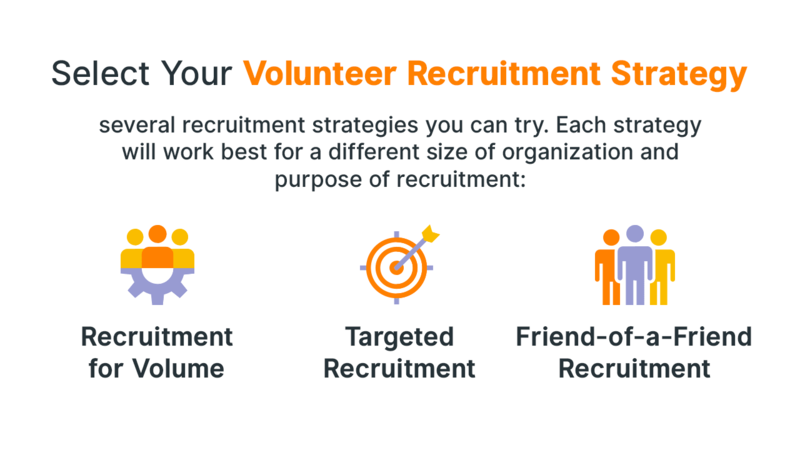 Targeted recruitment is also more effective for gaining long-term volunteers because it attracts people who are passionate about the cause your organization represents. Advertising for a targeted audience could mean speaking to a specific group at a school, posting an ad in a specialized journal or newsletter, or posting flyers in strategic locations where your intended audience will see them. Friend-of-a-Friend Recruitment: A great way to focus your recruitment is to contact people who are already familiar with your agency or connected to it in some way. These may be people who have personally experienced the problem your organization is seeking to solve, or they may be friends or family of current volunteers. If your organization is particularly active in the community, this technique can also work to recruit people living in the neighborhoods around you. Because these potential volunteers already know about you, they will be more comfortable with being contacted directly. When you contact these people, via email or through social media, they will already be familiar with your organization and more interested to hear about your volunteer opportunities. No matter what advertising techniques you use, do not underestimate the power of personal experience and storytelling. People are often persuaded through hearing stories they can relate to. Stories often have more impact on the listener than statistics or facts. Cold data only comes alive through stories from volunteers who loved serving with your organization so much they simply had to sign up to volunteer again. Use personal stories when advertising at volunteer fairs or speaking to students. Bring a current volunteer to your booth or event and ask them to share their experience. They can talk what they love about volunteering with your business, they can describe the day-to-day tasks of the position and can also give honest examples of what has been challenging about serving with your organization. Hearing real stories from someone who has volunteered with your organization in the past will make people feel more confident about applying to volunteer. When posting open assignments, include as much information as possible about the position. Include the location, the dates and times of the assignment, whether it is a one-time or repeating opportunity, and what volunteers should wear or bring. Include a detailed description of the tasks they will be completing so they know exactly what to expect when they arrive at the job. People are much more likely to apply for a position when they feel prepared and in-the-know. Volgistics provides an online directory feature that makes it easy for potential volunteers to access your opportunities and learn everything they want to know about them. The easy-to-read format allows volunteers to see all of the information about an open assignment in one place. They are also able to compare open assignments quickly to see if a different opportunity better suits their interests or schedule. People nowadays tend to be pickier about the organizations they want to volunteer with. Potential volunteers will want to know exactly who their service will be helping and where their donations are going. Volunteers want to really get behind the cause of your organization before they serve with you. Clearly summarize how your organization helps the community as well as the impact they could make if they volunteer. It’s also a great idea to include how serving will benefit the volunteer themselves. Even though the focus is to serve others, people are more likely to sign up to volunteer when they know it will also provide them with valuable skills or experiences. In some cases, volunteers will need to complete additional training sessions before they can jump into serving. Include these requirements clearly in the assignment posting so volunteers are not surprised. Additionally, if your opportunity requires the volunteer to have specific skills, list these in the job description as well. This will ensure only qualified persons submit applications for the position. Any open assignment should include a set of goals for volunteers to achieve. Having clearly-defined goals for a volunteer opportunity is as important as describing the tasks themselves. People are generally goal-oriented and are more motivated when they have something to aspire to. Describe how the specific assignment will make a difference for the community or your organization through clearly-expressed goals. While it may not seem important to create a job title for each volunteering role, providing a descriptive job title other than “volunteer” makes a person feel valued. They will know the work they are doing is filling a specific need or role within the organization. They will feel proud of the service they are providing and the title they get to assume. Remember that some of your volunteers might be students who want to include their service on a resume or job application. Give them a job title that reflects the valuable service they are providing. Make it easy for potential volunteers to access information about working with your organization. The volunteer page on your site should be clearly designated for volunteer recruitment with a heading like “How To Get Involved,” “Volunteer Opportunities,” or “Volunteer Today!” Include any relevant links on this page so potential recruits can read about open assignments and submit applications all in one place. To make the most killer volunteer recruitment page, keep it fun and user-friendly. Using online applications simplifies your onboarding process, which makes potential volunteers more likely to apply. Be sure to include only relevant information on your application forms so volunteers do not waste time entering information that does not apply to the role. This may require you to create separate applications for different opportunities. A good application should include all contact information and any skills they possess and offer a spot for the volunteer to submit any questions they may have about the position. Make sure volunteers can apply quickly and easily from your website using Volgistics’ online application forms. Our forms can be accessed through a simple link on your site and provide automatic email confirmation to applicants after they submit their application. Using Volgistics, you can tailor your application form to include as little or as much information as you want. You can also create different applications for each opportunity. All of this information will be automatically input into your Volgistics database, so there is no need for manual data entry. Any new applications will be sent directly to your Volgistics Mailbox, so qualified volunteers will never slip through the cracks. Leave some seats empty. It can be tempting to hastily fill every open volunteer opportunity. 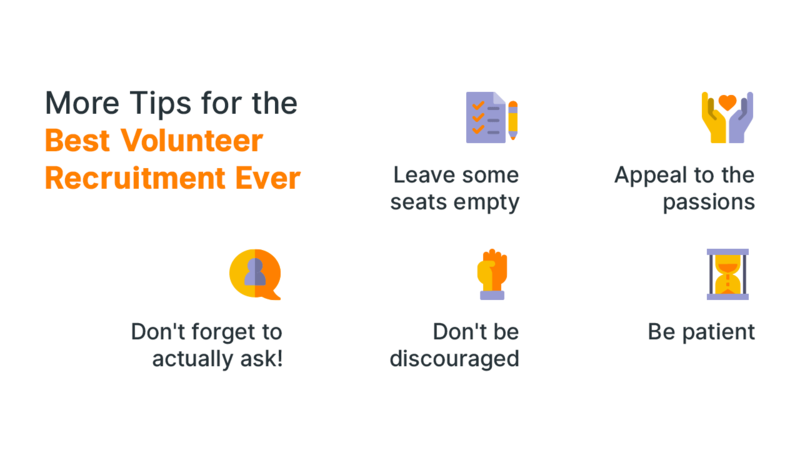 While it can be nerve-wracking as a volunteer leader when you do not have slots filled, an empty seat is often better than a volunteer who is not really interested or committed. If you choose the wrong volunteer, you may end up spending time tracking them down when they do not show up for assignments or correcting their work when it is not done well. A non-committed volunteer can also bring down the morale or enthusiasm of your other volunteers. If you want your nonprofit or other volunteer-driven organization to thrive, you want to hold out for passionate and engaged volunteers who also want your organization to succeed. Remember that saying “no” to one volunteer may leave that slot open for an even better volunteer to fill. Appeal to the passions of potential volunteers. If your organization works for a hot-topic cause, consider creating a promotional video or public service announcement that plays to the emotions of potential volunteers. Remind them how passionate they are about keeping the earth clean from litter or getting a state law passed. Sometimes even caring people need to be reminded why they are passionate about volunteering and why your organization is a great place to serve. Don’t forget to actually ask! Sometimes the best volunteer recruitment efforts fail because they neglect to directly invite potential volunteers to sign up or apply. After describing your opportunities and why the work you are doing is important, be sure to actually ask potential volunteers to commit to serving by prompting them to apply. When reaching out to volunteers who have served with your organization before, tell them why you appreciated their previous service and how you think they will be a great fit for a new service opportunity. When your volunteers feel valued, they are likely to respond positively when you ask them to serve. Don’t be discouraged if you get a “no.” Volunteer recruitment often involves putting yourself — and your organization — out there for potential rejection. While getting a “no” from a potential volunteer can be discouraging, remember that in some instances a “no” is really a “not right now.” Sometimes people who care about your cause are simply too busy at that time or their schedule does not permit a long-term volunteer commitment. However, they may be able to volunteer for a short-term assignment or in the future when they have more time. Don’t give up on volunteers who show interest in your organization but cannot fit volunteering into their schedule right now. Be patient and remember that good volunteer recruitment takes time. At first, it may seem like you are spending too much time recruiting for your volunteer opportunities without receiving many applications. However, creating a good advertising campaign and great recruitment page on your organization’s website will definitely pay off in the end. By committing to good volunteer recruitment, you will gain visibility for your organization and its volunteer opportunities that will lead to more volunteers who are a perfect fit. As industry leaders in technology for volunteer managers, Volgistics knows how important volunteer recruitment can be. Volgistics offers comprehensive volunteer management software designed for volunteer-based organizations of any size. 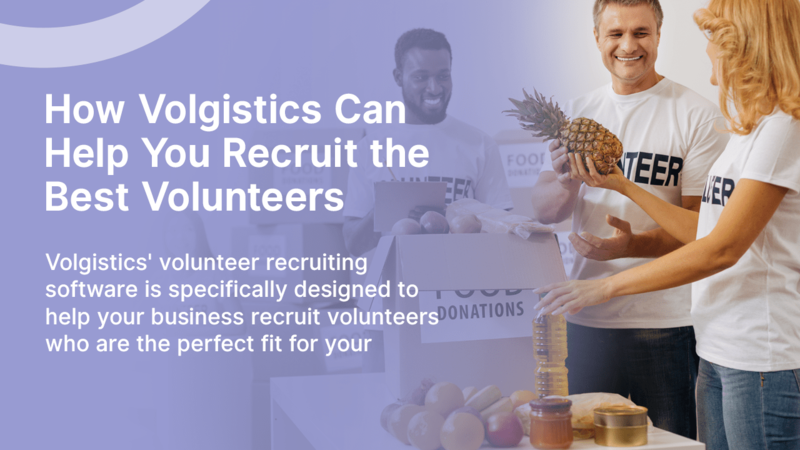 Volgistics’ volunteer recruiting software is specifically designed to help you recruit volunteers who are the perfect fit for your organization. Volgistics’ online directory feature allows you to post open positions to your organization’s website by simply adding a link. Your current volunteers can view these open assignments in the directory and sign up for the ones they are interested in. Potential volunteers can learn about your volunteer opportunities and gather all the information they need before they apply. Any time you want to update or edit assignments, you can do so easily without updating your website separately. Opportunities in the directory can be organized by category, too, so potential volunteers can quickly locate the assignments that suit their interests. Volgistics also provides easy-to-use online applications that take very little time to create and are even faster for your volunteers to fill out. By removing hurdles from the application process, potential volunteers are more likely to submit applications. Volgistics allows you to create multiple applications for each department or volunteer opportunity within your organization. This allows you to have different applications for long- and short-term volunteers or create a separate application for an event you are hosting. These online applications can easily be accessed from your website through a link. Once you have recruited awesome new volunteers, Volgistics can help you keep them organized through our other online volunteer management features. Volgistics allows you to stay in touch with volunteers easily through automated text and email services. Scheduling volunteers is further simplified through our online scheduling software. You even have the option to allow current volunteers to sign up for assignments on their own though Volgistics’ self-scheduling option. You will save time and energy normally spent scheduling and volunteers will be able to claim a spot serving at their favorite event or volunteer opportunity. Good volunteer recruitment is essential for the success of any volunteer-based organization. You want to find the best volunteers who are passionate about what your organization does and excited to lend a hand. If you want to see how Volgistics can boost your volunteer recruitment, consider signing up for a free trial today!